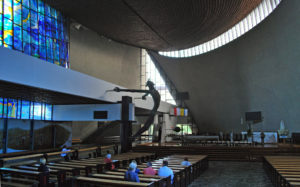 The Arc of Lord Church was built between 1967 and 1977. 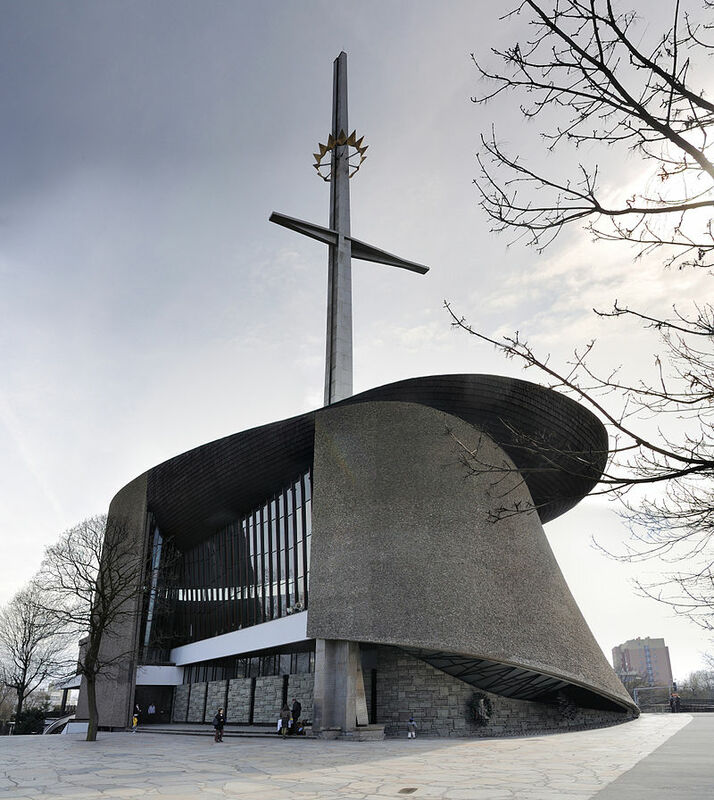 It was the first newly-built religious temple in the district of Nowa Huta, the communist utopia that was to become the ideal proletarian city in contrast to old bourgeois Krakow. At first, Soviet authorities did not allow any church to be built in Nowa Huta, but after many protests, the consent was achieved. 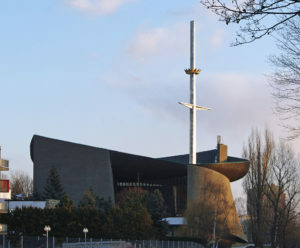 The people of Nowa Huta started to raise money and in 1957 a wooden cross was placed on a parcel near Plac Teatralny (Theatre Square) that symbolised the future church. Soon however the parcel on which it stood was adapted for the “1000 schools for the millennium” programme. The plans to build a church were rescinded and the cross was to be removed. In 1960 as the demolition was about to start, the people of Nowa Huta stood in defence of the cross. 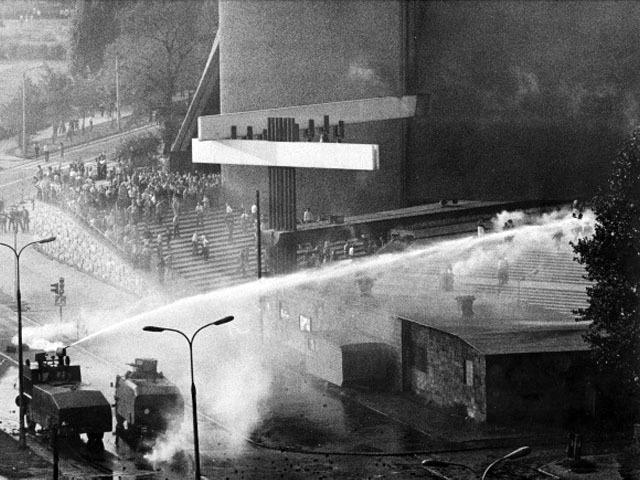 Mass arrests took place and protests turned brutal as the militia used excessive force, water cannons and tear gas. Attempts to build the temple stretched in time. Eventually, thanks to the endless efforts of the then metropolitan bishop Karol Wojtyla, the communist authorities permitted for the church to be built, but in a different location. Also no materials nor equipment was made available for the purpose of the construction works. It made it almost impossible for the project to succeed since the entire economy was state-run. Therefore the new church was built based on grassroots movement. 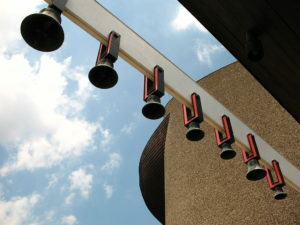 The cornerstone for The Arc of Lord Church was laid in 1969 and the church was consecrated in 1977 by Karol Wojtyla. In the 1980’s the church played an important role in resistance against the authoritarian communist government. When Poland was under martial law, the church held regular services for the Homeland on the 13th day of each month (martial law was declared on December 13th 1981, lifted in 1983). These services would often turn into mass protests and violent fights with the militia. The most tragic event occurred on October 13th 1982, when a 19-years-old student, Bogdan Wlosik was shot during the demonstration. His death only escalated the conflict and his funeral brought attention of over 20 thousand people. A monument commemorating this young man was erected on the exact spot of his death, not far from The Arc of Lord Church. The Arc of Lord Church was designed by Wladyslaw Pietrzyk in modernist style. Pietrzyk was inspired by the chapel at Ronchamp, a project by Le Corbusier. The roof of the church also connotes Noah’s Arc. 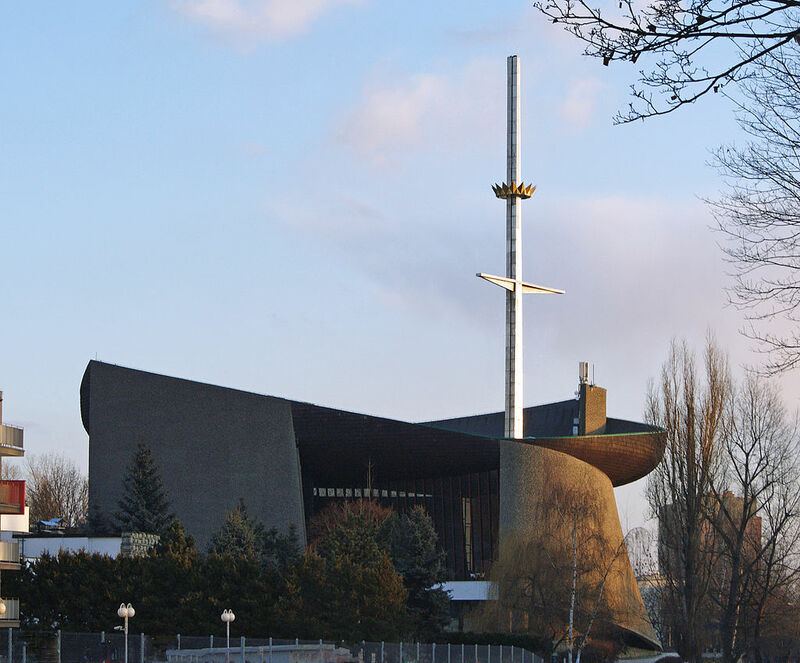 Dominating over the church is a 70-m cross resembling a mast, which is symbolical but it is also a constructional foundation of the framework. Seven doors lead to the church – the symbol of the seven sacraments, and seven steps lead to the altar – the symbol of the seven gifts of the Holy Spirit. The main altar was carved from a single marble block and styled in the shape of a flat hand. In the tabernacle, cast in bronze in the shape of a globe surrounded by steel rings, was placed a moon stone given to Karol Wojtyla by pope Paul VI, who had received it from the crew of the American spaceship Apollo 11. According to a macroscopic diagnosis carried out by scientists, however, the extraterrestrial origins of the stone are rather doubtful. A conspicuous, monumental crucifix by Bronislaw Chromy dominates over the chancel. It is a very bold piece of art, presenting Christ in a position that resembles him on a cross, but what really comes to mind is that he is about to fly into heavens. The Arc of Lord Church is an active place of worship. Masses on Sundays: 6:30, 8:00, 9:30, 11:00, 12:30, 14:00 (baptisms), 16:00, 17:30, 19:00 and at 10:00 during academic year (October-June). Masses on weekdays: 6:00, 6:30, 7:00, 7:30, 8:00, 11:00, 18:00. 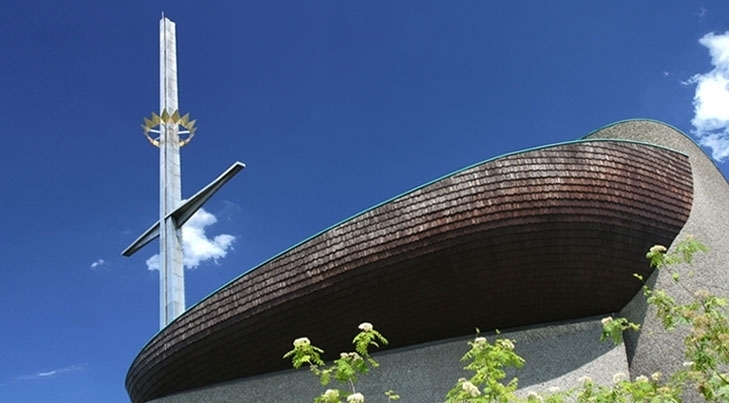 The Arc of Lord Church is open for visitors every day.